Once you develop some sort of infatuation with motorbikes and you decide whether your style is a racing bike, a dirt bike, a bobber or a cruiser, you like to make it your style statement. You think of biking whether you are home, college or at work and even when you want to play games on your cell phones, you prefer bike games. Keeping in mind that there are simply so many bike games out there and it is always hard to pick one of them, I have listed a few best biking games of 2019 so you won’t have any trouble finding best Android or iOS biking game for your spare time. Note: While biking includes mountain biking as well, I have only picked the games which are about motorbikes. Also, these games were made in different years and I consider them “best bike racing games of 2019” because based on their popularity, UI and UX, it is safe to say that they will remain the top bike racing games of 2019 as well. If you’re a fan of drag racing and you’ve been thinking about converting your bike into a drag race bike, this Android OS bike racing game is absolutely for you. The smart thing about this game is its capacity to adapt to any screen size. This means that whatever the size of your Android device is, you’ll enjoy the same high quality, HD gaming experience. If dirt or off-road bikes tickle your fancy, this game is exactly for you. This is yet another Android OS racing game, and with 10 Million+ downloads and 159K+ reviews, this game does not need any introduction. Those who love off-road biking stunts will love this game because it lets the player indulge into racing and while racing, the game user can easily perform stunts that usually moto racers do. If your favorite cocktail is mixing biking with violence and biking makes you think of Terminator 2 Fat Boy and its rider, then you would love this game. How about racing with other bikers on the road and attacking them at the same time with different dangerous tools like Molotov cocktails? This game enables you to choose different tools to attack other bikers on the road and collect new helmets. Real-time biking experience with realistic controls and nitrogen etc. This is yet another Android bike racing game. If you loved to bike on a ‘long black road’ and you like highway racing games, you’ll be interested in this game as well. The game puts you in a bike rider’s shoes who is driving crazily on a highway, through trucks, cars and all sorts of traffic, with one single aim in their mind: hit the leaderboards as faster as they can. There are two types of bikers: the first type is of the bikers who believe in biking with grace and then there are the others who believe in biking with race. If you own a racing bike, you want to buy a racing bike or love racing on the roads; this game will inspire you a lot. The best thing? Without putting your life to risk by racing fast on the road, you can enjoy the same via this gaming app. You get to cruise on a big road with a lot of traffic, at a speed that you will never dare to try in the real world. However, with all the traffic and other graphics, you feel like having a real life biking experience. With 5 million plus downloads and 71K reviews, this bike game attracts every Android bike gaming addict who loves drag racing and simple road racing. This game takes you on a journey that includes intensive bike racing with really good graphics and nerve wrenching experience with competitive bike racing. You have to bike hard and fast to beat your rivals in a setting that looks like a busy city, and they call it The City. Go through different districts, enjoy the look and feel of each unique road and district. It is a very thrilling biking, and drag racing experience with bike customizations, multiplayer racing, challenging races with gangs who rule The City offers you the bikers who compete with you from all over the world on Highway that you get familiar with. 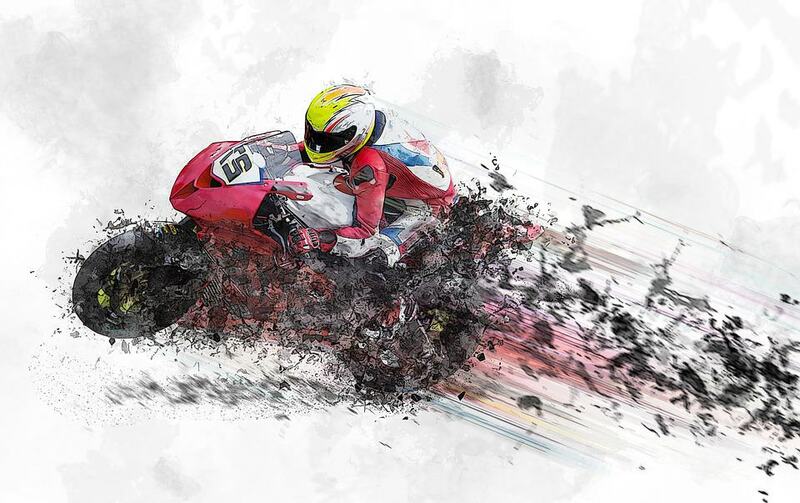 When it comes to bike racing, the type of bike that comes to mind is racing or heavy bikes. Yes, we have all sorts of bike lovers among us. There are those who love choppers, those who love cruisers, those who love bobbers and café racers, those who love dirt bikes and then we have the biggest biker fan group and that is of heavy bike lovers. If you love drag racing and you love heavy bikes as well, this game deserves at least a try. The game is packed and loaded with features and graphics that will make any bike racing games fan fall in love with it. It lets you compete with challengers from all over the world in stunning 3D race environments, and you can choose settings, bikes and the stage that you want to play at. Bike Race Free is a game that you can download from the Apple App Store as well. This game is based on dirt biking and stunt gameplay. So those of you who love highway racing will be disappointed if they downloaded this game. Those who love stunts and dirt bikes will fall in love with this bike racing game. Its graphics, gameplay, cinematic angles, and everything will make you fall in love with it. It is one of the top bike racing games of 2019 because of its challenges and stunts that a rider can perform. If you’re looking for a bike racing game which is not entirely based on real-world like graphics and which is more leaning towards creative animations, this game is what you will love to play. It tests your bike riding skills on such surfaces and roads that you cannot think of. For example, think of doing some biking on the moon while you are fully cladded into a spaceman’s suit and jumping off a cliff. The stunts that you can do show why it is that over 5 million people liked to download this game. This game is intended for those who want to get the most out of biking. Racing is only where it starts and what they really look forward to is madman stunting. If you think that you are the kind of person who will like to perform a bike jump over 20+ cars, this game will excite you. This bike racing game has many stunts, and they called it a circus for a good reason. You will feel like a circus biker going through a fascinating acrobatic racing experience. You go through different scenic environments, performing stunts like a circus biker and you really enjoy this game. There are a few App Store bike racing games in this review, but this one is the most special one. Do you know why? It is because in this bike racing game you do not only race on wide and full of traffic highways and you do not always enjoy stunts or beating your competitors, but here you also love the element of attack. This bike racing game lets you attack the other biker in many different ways. This really makes your biking experience interesting, not to mention the stunning graphics and controls. Whether you have an Android device or Apple one, download any of these games that suits your bike racing type and get indulged in the intensive gaming experience, but please do not forget to let us know how you liked these games and this review. Previous articleHow to Use SHAREit on PC to Transfer files from Phone?